Mrs. Mina’s wish to bring to Athens something from the Longing for Messinia, where she was born and the love of the land, as incited by her grandfather, Yannis Fidas, who offered her hospitality during the summers at a small property in the plain of Messinia, Eva, situated near Ancient Messini (Ithomi), combined with her true dedication to the pure taste of Greek traditional products, impelled her to buy the first property of two and a half acres at the seaside of Marathonas. Following that, the course and progress of ecological farming, appearing at that time to be quixotic, incidental, strange, until nowadays, that the property is five times larger and has become a small S.A. (as she also wanted to be a proper professional) just like her farming products and stock were proper, there has been a very long and rough road, but the satisfaction at the results is not at all insignificant! We are not saying it’s profit-making, but when you manage to pass on the message of environmental protection, pure taste and life in general to more and more people, then figures are of minor importance. OAK S.A. was established in 1994, also incorporating the lands with olive-trees in Messinia, and now produces the “extra” virgin cold-pressing olive-oil. Thus we feel more complete, more self-sufficient, as we can have a yield which is, of course, small but includes all garden produce, an excellent wine, together with the small quantity of traditional cheese made from pure sheep’s/goat’s milk, as well as the extra virgin olive-oil..
A small Unit which we also want to play the role of “school” for other producers. Our products are distributed to 3 – 4 ecological products shops. They are branded and certified by BIO HELLAS. Moreover, as we tried to have pure products for enriching the soil with biologically tested materials, we happened to come across the “living soil”, coming from thousands of miles away, certified (concerning its purity) by N.C.S.R. Demokritos, and we are pleased to represent these products, for any producer interested in testing their power and purity. 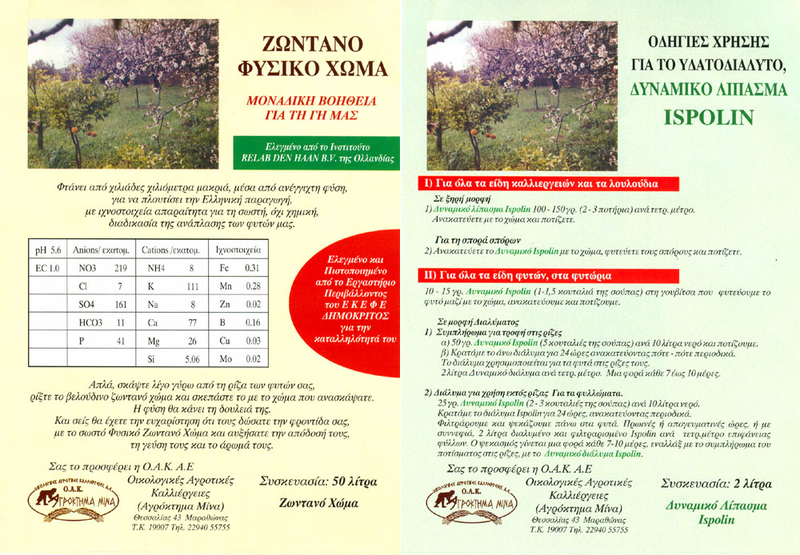 The effort that commenced thirty-fine years ago from “Mina Farm” in the premises of Marathonas and the heavenly Messinian plains with the silver-shadowed olive-trees, appears to attract significant support from people adhering to the idea of pure nutrition and thought , that being the greatest “gain” for our small non-the-less ambitious effort, which courageously commenced so many years ago with non-existing commercial prospects but with sincere belief in what we call “pure thought” and “common sense”.